Traditionally, scented tea is made from different types of finished tea leaves that are scented slowly with different fresh flowers to absorb aroma and flavor. Most scented tea won’t be sold with the flowers themselves, the tea has already absorbed the aroma during the slow processing. Chinese tea makers describe good scented tea as having a floral aroma absorbed in to its “bones.” Tea has a character of slowly absorbing any flavor and aroma around, meaning quality scented tea will take at least 2-3 weeks to fully absorb the scent. For high quality scented tea, the tea must be scented with fresh flowers for hours at a time, multiple times. After being scented each time, the tea master must be very patient to remove the moisture that has been absorbed in to the tea from the fresh flowers. Modern scented tea, also called flavored tea, is mixed with different dried flowers and dried fruits. These inclusions do not have much scent on their own, so the makers of flavored tea have to spray the tea mixture with essential oils to give it an aroma. Our scented tea is made with traditional methods, using fresh only flowers. Scented teas were invented in the Tang Dynasty (618-907). In that time, people would compress fresh leaves to make highly concentrated tea, and scent it with Long Lao (a blend of herbs) to give it a strong aroma. In the early Song Dynasty (960-1279), tea culture changed to appreciate pure tea without the addition of flowers and spices. In late Song Dynasty, around the 12th century, scented tea made its return in the form of jasmine and osmanthus tea from the region that is now Guangdong Province. This is the earliest record of jasmine tea. In the Ming Dynasty (1368–1644), tea scholar Gu Yuan Qing, in his tea book “Cha Pu,” mentioned jasmine, rose, orange flower, gardenia, osmanthus, and plum blossom, etc to scent with tea. The ratio of tea to flowers was 3 parts tea to 1 part flower, as not to overpower the tea’s flavor. He also mentioned lotus tea made by placing tea leaves in a newly opened lotus flower then slowly drying it to absorb the lotus scent. At the end of the Ming Dynasty, zhu lang flower, dai dai flower were the most popular flowers to scent with. Jasmine tea was also produced in Ming Dynasty, but in very small quantities. Jasmine tea was mentioned in this time as a medicinal herb because it is regarded by Chinese medicine as an herb with balanced character, neither cooling or warming, but helpful in balancing chi. It was used for treat dry skin and tense muscles. By the 1850’s, Jasmine tea became very popular in northern China. At the time, it was very difficult to keep tea fresh during a long trip into the north. Jasmine tea’s sweet aroma not only maintained its character in transit, but also preformed well when steeped in the north’s highly alkaline and mineral dense water. It should be noted here that jasmine flowers are not originally from China. Around 304 AD, during in Jin Dynasty, the jasmine flower is mentioned as an import from central Asia. Jasmine flowers were first propagated in the warm Yunnan, Guangdong, and Fujian Provinces. Much later, around 1880, out reaction to jasmine tea’s surge in popularity during the Qing Dynasty, Taiwan and Sichuan began producing their own jasmine flowers from bushes transplanted from Fujian. Since that time, Sichuan Province has grown to be one of the largest centers of jasmine tea production in China, alongside Fujian Province. Despite Fujian and Sichuan being the centers of Jasmine tea production, in the time since World War II, the production of jasmine flowers for jasmine tea has moved to warmer provinces. The country’s largest jasmine fields are now in Guangxi Province. Many jasmine tea producers in Fujian will transport their tea leaves to this region for the scenting process since jasmine flowers will only stay fresh for about nine hours. Yuan Jiang County in Yunnan Province also has developed large jasmine flower fields. It is warmer in this region, so fresh jasmine flowers can be picked as early as March (other regions don’t harvest until May). Each jasmine growing area has different varieties of jasmine flowers, and since there are these different varieties can sent different grades of teas, there is a very wide range of possible flavors in jasmine tea. Our company carries different grades of jasmine tea and one rare tea that is scented with orchid. These are a great place to start if you would like to drink something other than pure tea leaves. If you’d like to make a blended flower tea of your own, you can try some of the following recipes: Use 1/2 Tbs of Monkey Picked wulong tea with 1 tsp osmanthus flower; 1 Tbs Da Fo Long Jing (Dragon Well) with 1 tsp osmanthus; 1 Tbs Gong Fu with 7 pieces of rose buds; 1 Tbs home store puer tea with 1/2 tsp chrysanthemum buds. This can be a great way to experiment with blending some of your favorite herbs and fruits with teas, and this way you can personally control your quality of tea, flowers, fruit, and other inclusions. Most scented tea are made from blending completed green tea with fresh flowers, although some producers do use completed black or wulong tea. Scented tea’s production season depends very much upon the harvest season of different types of flowers. For example, good quality Fujian Province jasmine pearl’s green tea will be made in early April. The green tea will be stored until the jasmine blossoms grow, around the end of May to early June. It normally takes about 2-3 weeks for the scenting process, meaning the completed tea will be finished around the middle of June. 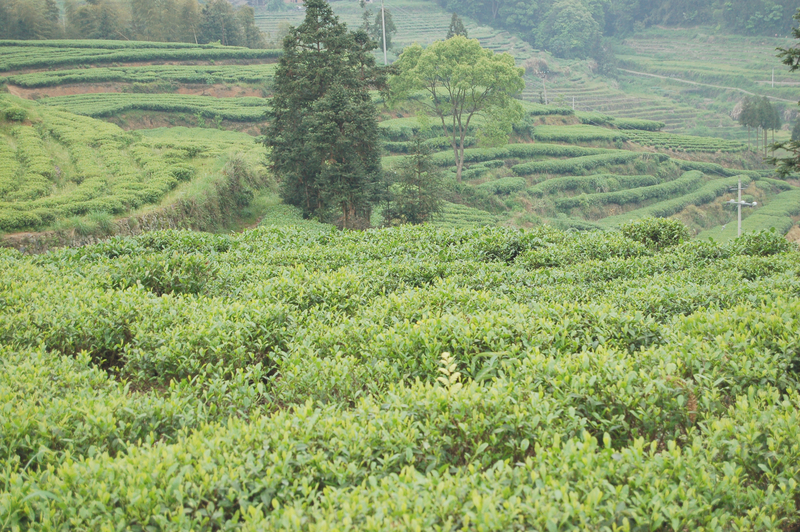 In Sichuan Province, the completed good quality green tea will be finished in March. They store the tea in a cool area to wait for their jasmine flowers to grow, in early May. In Yunnan Province, they produce jasmine tea almost two months earlier than Fujian jasmine teas, making their tea’s character very strong. Our Emperor’s Orchid tea, which takes about 8-10 days to scent, can be made early in the year, just as soon as the spring harvest green tea finishes production. This is due to the fact that orchid flowers have four seasons and are grown in a green house. Scented tea’s quality is distinguished by Chinese tea industry standards. In general, high quality scented tea is made from high end green tea made in early spring, and is scented multiple times with fresh flowers. These teas take a long time to process. For example, our Snow Drop Jasmine tea uses high grade green tea from Meng Ding tea region, similar to our Sweet Dew ( picking standard 1 bud: 1 leaf).Normally this tea is completed during the middle of March- early April. The tea will be stored in a cooler until around early May when the fresh jasmine flowers have grown. They will only pick jasmine flower buds just before before they are set to open, the jasmine tea masters refer to this type of jasmine flower bud as a “tiger’s palm.” The jasmine flowers must be used the same day they are picked, because their best aroma will strongest for about 9-12 hours. They carry the fresh jasmine flowers back to the factory and allow them to breathe by piling the flowers about 10 cm high to lose some of their moisture. At this time, tea is removed the tea from cold storage. For high quality jasmine teas, they will use a ratio of 60% tea: 40% flowers. The first layer is 1/5 of the total quantity of green tea, covered by a layer of 1/5 the total quantity of jasmine. This is followed by another layer of green and jasmine flowers again, for a total of five layers at a time. This layering process must be completed within 1 hour. The tea will sit this way for 5-6 hours to slowly scent. After 5-6 hours, the tea and jasmine are mixed together to release heat and moisture. After the flowers and tea have been mixed, it sits again for another 5-6 hours. A machine is then used to separate the used jasmine flowers from the tea. The tea is carefully re-roasted to remove the moisture that has been absorbed from the fresh flowers during the scenting process. The dry leaves will be given a few days to rest and absorb the scent. After a few days, the tea is ready to be scented again with another batch of fresh flowers that have just been picked that morning. 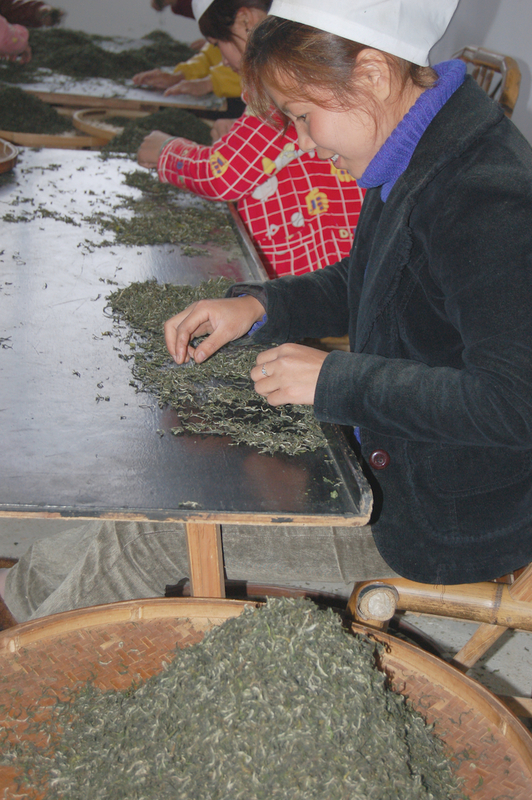 The second scenting process, they will pile thicker amounts of tea leaves with a thicker amount of fresh flowers. This process is repeated over and over 5 times, which takes at least 2-3 weeks to finish. For lower grade jasmine tea, like our White Cloud Jasmine, they will use lower grade green tea. The same process is used, but they will pile the tea and flowers higher with a smaller amount of jasmine flowers. The tea will only be scented with jasmine 3 times. Many producers like to use rich, strong magnolia flowers for the first scenting process, like our Jasmine Pearls. For people who enjoy the natural rich aroma, magnolia will make the jasmine tea much stronger. Besides receiving any benefits from the green tea, you also get the benefits from the flowers themselves. According to Chinese medicine, jasmine flowers can relieve the blood vessels around your eyes and help relax your muscles. Many people like to drink a cup of jasmine tea after a long day of work to calm the body. Orchid flowers are also used as medicinal herb by Chinese medicine practitioners. According to Chinese medicine, it can help chi flow through your body. Even 2,500 years ago, the famous scholar Confucius, suggested that scholars keep an orchid flower near them during studies to refresh their brains. Some people are sensitive to scented tea, but we hope you can find enjoyment from our naturally scented fresh flower teas, made without chemicals and oils. As with any type of tea, we suggest using 4 grams to 12-16 oz pot. Your water temperature should be about 190F. For pearl shaped tea, you need to infuse about 2-3 minutes for the first infusion, because it needs time to open and give flavor. For loose scented tea, from low to high grade, we suggest your first infusion should be about 1-2 minutes. Lower grades should always be brewed for a shorter amount of time. Adjust the amount of tea you use and brewing times for each infusion depending on how you like your tea. Good scented tea can be reused about 4-5 times. The difference is easy to spot between quality scented tea and a cheap commercial grade. To test, infuse your scented tea for three minutes with hot water, then brew a second cup. For tea using scented oils, the flower fragrance and flavor will be entirely gone after just one or two infusions. True scented tea can be expected to hold its fragrance even after five infusions. As mentioned above, real scented tea is said to be “scented to the bone” – this should be evident when it is brewed. The dry tea leaves of high end scented tea should be smaller in size and have white hair from tea buds, like our Silver Dragon Jasmine Pearls. Good tea should use higher grade tea leaves with a high count of tea buds, which should still have its fresh green color. Good scented tea will yield a light amber-colored tea liquid.